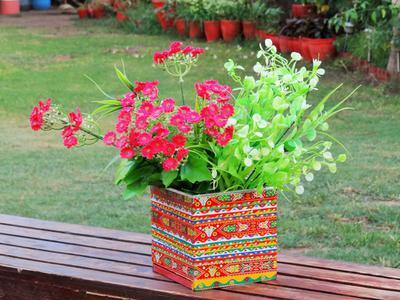 StarShine offers a variety of Pakistan's Truck Art accessories and home decor products for all ages. 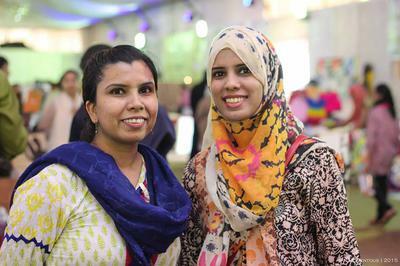 A. Karachi, the city of lights and hub of beautiful places always fascinates people of Pakistan as well as foreigners. It is the largest metropolitan city and heart of Pakistan where people enjoy music, sea breeze, historical places, festivals, food and diversified cultures and so use rickshaws and buses as a means of transport to travel around the city. Our buses, trucks and rickshaws are adorned with 'truck art' that has vibrant colors, cultural themed art, indigenous floral pattern and poetic calligraphy which drives everyone crazy and has become a recognition of Pakistan. The same drives me crazy and makes me pick the art that represents my culture as well as brings my passion to the next level where the definition of truck art (specifically done on buses, trucks and rickshaws) can be redefined on home decor items which can be used as souvenirs for tourists, for adding color to your own house and to bring our culture anywhere around the world. Q. How did you get here and how long have you been in this profession? A. I started this project in 2014 from a charity exhibition where we showcased few designs on books and key chains along with other products. This was the time we realized and strongly felt that people are very attracted to this art form and appreciated their cultural look. 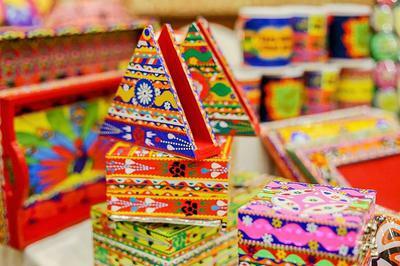 Foreigners who really like to take back something as a souvenir that is representative of the culture and colors of Pakistan were very much attracted to these. From then onwards we decided, focused and planned our business and now Alhamdulillah the beauties of buses and trucks are transformed by the StarShine team into home decor items. A. Being an individual and home-based start-up business in the field of art it is difficult to learn, understand and most important - to be able to approach the experts behind these works. These kinds of products are not easily available in the market and also are limited in stock and variety. StarShine wants to make these products easily available by offering a range of products, different varieties of truck art themed work and customization as per the desired need of the customers. 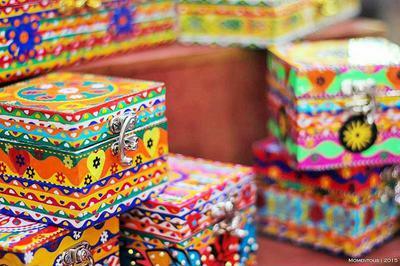 StarShine is unique and peculiar in designs because of Chamak Patti Truck Art work, the only handmade truck art available in Pakistan. A. Being a woman, it was quite difficult to jump into an art form which is not so common like other art and quite impossible to get the material of this particular kind and equally difficult to develop. I believe having faith in Allah (He is the most Kind), dedication and hard work can bring out the best in you. In the past 04 years, a substantial segment of the market has been captured. A number of new customers have been created and old talents rekindled by inspiring them to make a comeback again after the 90’s. As of now we are providing services throughout Pakistan and exhibit our work at different forums especially in Karachi region. StarShine has also been represented at international level and got the chance to exhibit to and work for renowned retail chains. We have a good number of corporate clients requesting for StarShine services on as and when basis. A. Currently we are working on product enhancement and adding new theme work to our products. We are in expansion phase to collaborate with likeminded people and places where StarShine can easily be made available. Q. A word of advice you would like to pass on to other women struggling with their startups? A. There is a saying that 'Behind every successful man, there is a woman', we as women are the backbone of every success that has happened in this world, so start believing in yourself and create your own success stories. Soon you will be like the sky full of stars and shine like never before. Cheers!